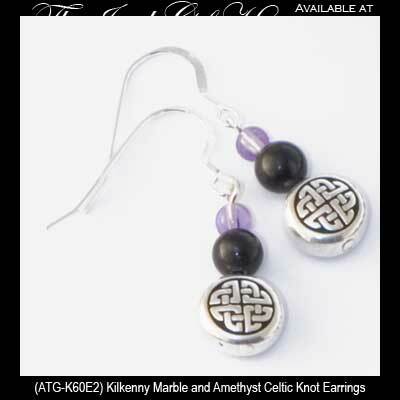 These Irish drop earrings feature Kilkenny marble beads that are enhanced with both amethyst and Celtic knot beads. The Celtic knot earrings measure 8mm wide (a little less that 3/8") x 1 1/2” tall, including the sterling silver fishhook wires; they are gift boxed with Celtic knot and Kilkenny marble history history cards, complements of The Irish Gift House. The marble earrings are made in Kilkenny, Ireland by All That Glisters.